Butterfly Reflections, Ink. : Turtley Awesome Chevrons! Hello there, friends! It's Kimberly Rendino here today guesting on the Butterfly Reflections, Ink. blog. I'm so happy to be here, and I've got a bright and cheerful birthday card to share with you today! I've used the Stacked Edges 1 dies from Pretty Pink Posh to create the fun chevron background. After I had all of the pieces adhered to my black card base, I was hesitant to cover too much of it up - I just love that color combination! To solve that dilemma, I kept the stamping design on a 2 3/4 strip of paper. 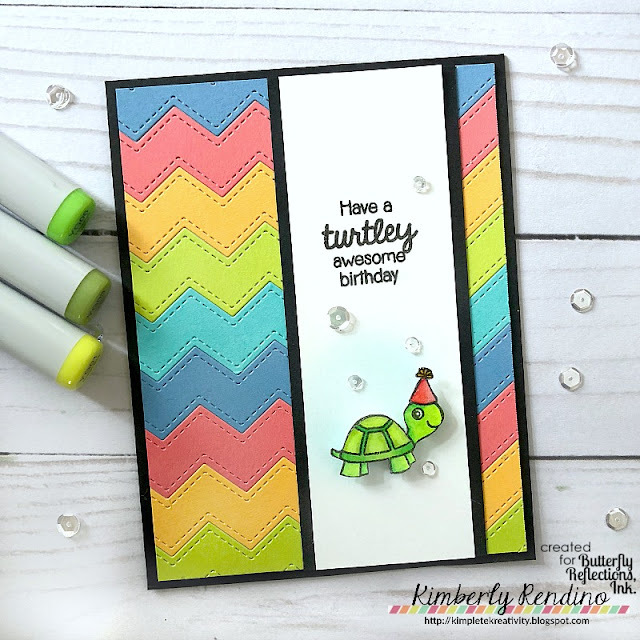 For this, I used the adorable turtle from the Sunny Studio stamp set Turtley Awesome. First I stamped the party hat and then used masking paper to mask it off. Next I stamped the turtle. When removing the mask, it looks like the hat fits on the turtle's head perfectly. I colored this with Copics and fussy cut it out. I stamped the sentiment with Versafine Onyx Black ink. I added a bit of color behind where I wanted to place the turtle using some Tumbled Glass Distress Oxide Ink. 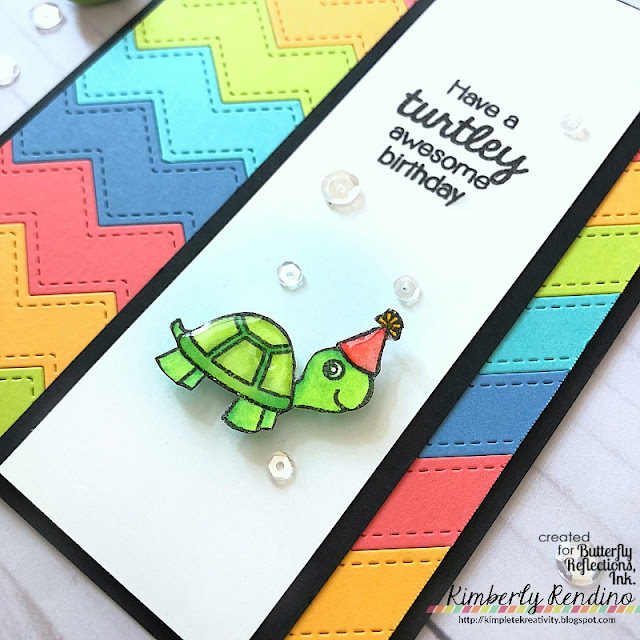 I added the turtle with foam adhesive and finished the card off with some Glossy Accents to the turtle's shell & party hat and a few Sparkling Clear sequins from Pretty Pink Posh. I hope you've enjoyed today's post! Be sure to head on over to Butterfly Reflections, Ink. to grab any of the supplies I've used. Vanessa is always adding more goodies to the shop, so be sure to check out what's new! Have a wonderful week! What a cute card! I love the fun chevron background!